The Asian Forum for Human Rights and Development (FORUM-ASIA) writes this Open Letter to the House of Representatives Committee on Human Rights in the Philippines to emphasise the importance of enacting provisions to protect human rights defenders (HRDs) under the domestic legal framework. Providing protection to HRDs under the national legal framework is necessary to protect those that are targeted for their legitimate human rights work. From January 2017 to July 2018, FORUM-ASIA documented 40 emblematic cases of attacks, intimidation and harassment against defenders in the Philippines. Among these cases, 18 were killings of HRDs – mostly journalists, and land and environmental rights defenders. Perpetrators are often not brought to account, and impunity of security forces is prevailing in the country. In 2016, Global Witness identified the Philippines as the third deadliest place in the world for HRDs working on land rights and the environment. This increased to the second deadliest place in 2017, as 48 HRDs were killed in what has been the highest number ever documented in an Asian country. It has been widely documented by internationally recognised and respected human rights organisations in the Philippines and elsewhere that HRDs in the Philippines continue to be targeted, harassed and vilified as a result of standing up for the rights of others. Duterte, are not only targeting HRDs in the country, but are legitimising and encouraging attacks against them. Not only was the UN Special Rapporteur on the rights of indigenous peoples falsely branded as a ‘terrorist’ to discredit her, but he also expressed that HRDs that criticise him would be investigated and, potentially shot, for undertaking their work. Considering the deadly situation for HRDs in the country, FORUM-ASIA welcomes the initiative from the House of Representatives to provide legal recognition of HRDs, as well as a robust protection mechanism under the domestic legal frameworks. Initial steps have been taken under different proposed bills. These have included: the Senate Bill No. 1699 (‘Human Rights Defenders Act of 2018’), the House Bill No. 1617 (Human Rights Defenders Protection Act of 2016) and the House Bill No. 8128 (Human Rights Defenders Protection Act of 2018). However, further steps must now be taken in order to implement safeguards and provide the level of protection to HRDs they require, as well as to further strengthen the Government’s obligation and responsibilities to protect them in the country. The House of Representatives Committee on Human Rights should also recognise that existing domestic laws and policies are not providing the adequate protection necessary for HRDs. A new law is needed that is comprehensive, robust and designed with the specific purpose of giving HRDs legal recognition and providing them with meaningful protection. Such a law also should particularly address the protection needs of vulnerable groups of HRDs, such as those focussing on indigenous peoples’ rights, and land and environmental rights. 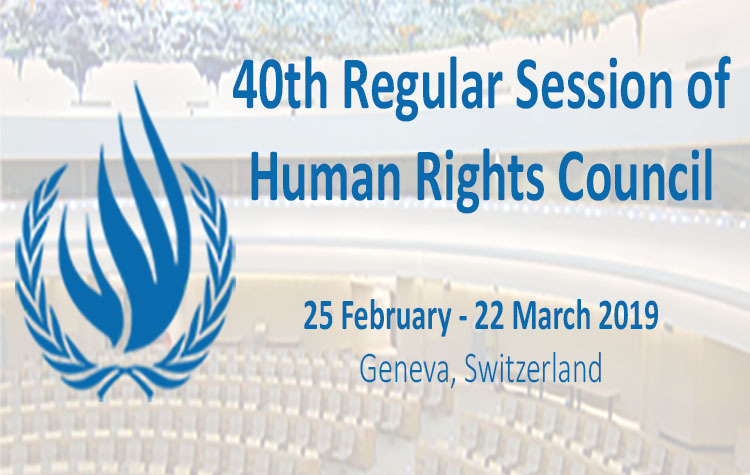 This year marks the 20th anniversary of the UN Declaration on the Right and Responsibility of Individuals, Groups and Organs of Society to Promote and Protect Universally Recognised Human Rights and Fundamental Freedoms, known as UN Declaration on HRDs, adopted by General Assembly Resolution 53/144 of 9 December 1998. FORUM-ASIA believes that there is no better time for the Philippines to demonstrate its commitment to protecting those defending human rights and to show its adherence to international human rights standards. In addition, as the Philippines pledged during the election of members of the Human Rights Council in October 2018, the Government is committed to continue to enhance domestic implementation of all human rights treaty obligations and programmes. FORUM-ASIA believes that the enactment of a comprehensive protection law on HRDs would be one of the best ways to fulfil its promise. Meaningful steps are taken to enact domestic law that recognises and protects human rights defenders. Any law addressing the protection of HRDs is in strict accordance with international human rights standards. Any legal provisions to protect human rights defenders recognises the definition of HRDs as outlined in the UN Declaration on HRDs, and includes specific protection needs of vulnerable groups of HRDs, including those working on land and environmental rights, and indigenous peoples’ rights. The content of any law on HRDs is comprehensive, robust, and designed to provide protection and hold perpetrators of violations to account. I thank you for your attention on this pressing issue, and am available to provide you with any further information if so required. To download a PDF version of this letter, please click here.